That is the question a lot of people have been asking and re-asking since the whole BPA thing reared its ugly head. For those who have not heard about this, BPA is Bisphenol A, used in a lot of plastics and can linings and many other things. And it is, in many circles, deemed to be toxic. g in 2008, several governments questioned its safety, prompting some retailers to withdraw polycarbonate products. A 2010 report from the United States Food and Drug Administration (FDA) raised further concerns regarding exposure of fetuses, infants, and young children. In September 2010, Canada became the first country to declare BPA a toxic substance. In the European Union and Canada, BPA use is banned in baby bottles. Canned tomatoes can be a homecooks wonderful helper. Except that the liners used in most cans contains BPA. And the acid in the tomatoes can break down the liners, causing the BPA to leach into the tomatoes. There are some products that DO NOT use BPA in packaging. The first that comes to mind is POMI brand tomatoes in a Tetrapak. But these can be expensive and hard to find. Me? I mostly use fresh tomatoes or sauce from a jar. I have not found diced tomatoes in a jar, but I really have not looked. I also like the paste in the tube. But a friend brought up the tomato thing yesterday, which got me to thinking about it. So I sent off a quick note to the parent of Muir Glen, a brand of canned tomatoes I have seen at Whole Foods (someone also said they have them at Target). I figured if they have it at WF, maybe there is a chance they don't use BPA-cans. Thank you for contacting Muir Glen about bisphenol-A or BPA. 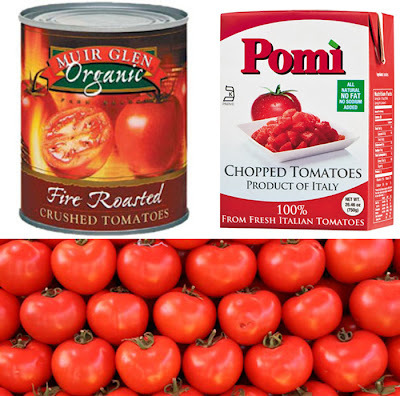 As of October 2011, Muir Glen canned tomato products do not utilize BPA in product packaging. Muir Glen continues to believe BPA is safe based on the weight of evidence of scientific and governmental bodies worldwide, including comprehensive risk assessments in Japan and the European Union along with the European Food Safety Authority’s reaffirmation in December 2011 of its opinion that there is no new evidence to suggest the tolerable daily intake of BPA needs to be lowered. The FDA has also endorsed the safety of current exposure levels. However, we know that some of our consumers have chosen to avoid BPA, so we had been looking for alternatives. Working with our can suppliers and can manufacturers, Muir Glen was able to develop and test a safe and viable alternative that does not use BPA for our canned tomato products. We began transitioning to those linings with the fall 2010 tomato pack – and we completed that transition with the 2011 tomato pack. The new liners are a vinyl based liner. The safety of this can lining has been thoroughly tested. In addition to complying with requirements set forth by the FDA, Small Planet Foods board certified toxicologist has concurred with this assessment. Your views are important to us. Again, thank you for contacting Muir Glen, and thank you for your support of our products. So, there you have it. Another BPA-free alternative for canned tomatoes. Of course, I will still continue to use fresh as much as possible. check out New Fashion Trends and upcoming fashion and styles ... celeberty styles and fashion and much more ..